I was fairly convinced I was going to love Paul Cornell's Witches of Lychford. It's a novella about a small town at risk of falling prey to supernatural forces under the guise of the building of a new supermarket. Three women - an irascible witch, a vicar and the owner of a local new age shop coming to terms with her discovery that Lychford is built on a portal to the world of the fairies - join forces with some reluctance to foil the supermarket scheme and hence foil the evil plan to take control of Lychford. It features a small English town, interesting female characters and has elements of English folklore; these are all things I enjoy in fiction. Unfortunately, I just felt Witches of Lychford was somewhat lacking. There was plenty about it I enjoyed, particularly some of the humour; a couple of lines are laugh-out-loud funny and there's a satirical tone throughout. The three women at the heart of the story are solidly rendered and convincing, and the set-up is a promising one. However, its short length - it comes in at under 150 pages - means there is little time for the plot to develop in any depth, and there isn't enough going on to give it sufficient pace to make up for this. The resolution of the story is somewhat anticlimactic too. There was something about Witches of Lychford that made me feel as if I was reading a synopsis for a 90-minute TV drama rather than reading a novel. It's fun, but the story is all over almost before it really begins and I didn't find myself particularly desperate to keep turning the pages. I also felt I'd have liked it to be creepier, more unsettling - the cover, I think, is somewhat misleading as I didn't find it particularly eerie at any point. 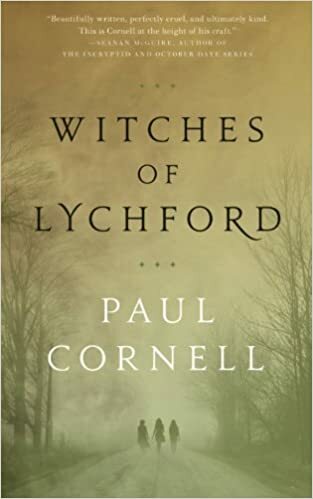 I'd definitely look out for more books by Paul Cornell as the ideas and characters in Witches of Lychford held much appeal for me and there were some very sharp, well-observed lines. I would, however, want to look for a longer and more involved novel next time.